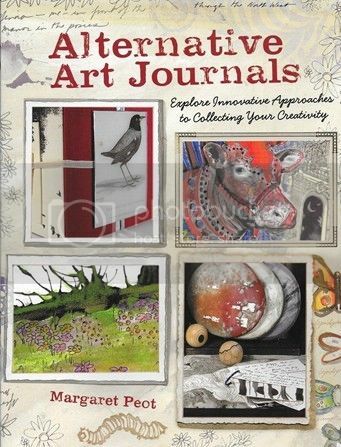 My pick for book of the month for March is Margaret Peot's Alternative Art Journals, which is an excellent how-to on making journals in a variety of book and non-book forms. Galleries of finished projects in every chapter offer a look at not just one but multiple examples of each technique. The box journal chapter is especially interesting, as it shows you ways to preserve any assemblages or collections you might have made or keep. I have a habit of saving all my Chinese take-out fortune cookie slips, as I think they're funny, and it would be neat to come up with a box journal to not only store but showcase my little collection. You scrapbookers will probably love the chapter on tag and charm journals; that one features some interesting bundled and bound journals to try. I've never made my own scroll journal, but I think I might give that project a go. I felt an immediate, strong connection to the images in that chapter, and I think it's because to me scrolls were the first evolution of writer materials (I know clay tablets are older, but they're not paper.) It would also be interesting to see how I could tell a story with a scroll journal. The project instructions are clear, easy to follow, and come with lots of photo examples and work-along examples. Some of the projects are also easy enough that supervised kids could make them. I think if you love to make your own books and journals, this is a great source of inspiration and direction to test-drive.